Who are light workers? Are you one? We are multi-dimensional beings, who are evolving. In our sleep state, we naturally exit our bodies to visit other dimensional realities for our growth and learning. Learn about OBEs. Hear Katy share an extraordinary OBE she had on 11/4/15. Soul Evolution Center Show to Evolve into Your Best Life! A special time where different dimensions intersect for spirituality & metaphysics. 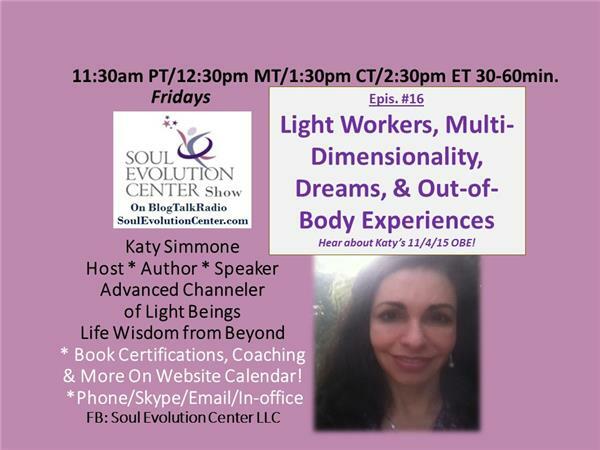 Connect with Katy for her sharings of her psychic experiences & channeled messages on her Blog, on Soul Evolution Center FB page, & YouTube.